Financial planners tell customers to buy mediclaim of Rs5 lakh or more, to be covered adequately. While this is, indeed, good advice, planners do not tell customers about the shortcomings in the product itself which can mean that your claim may not be fully paid. Product drawbacks, like room rent limits or procedure sub-limits, can lead to partial claim settlement and reduced compensation claim amounts, about which you can try to get informed from the policy wordings. But what about things which are not defined in the policy but can still render the mediclaim useless? There could be complete rejection of claims, for no fault of yours. You can only control what you know; but most of us cannot anticipate the various conditions which can lead to claims denial. We are highlighting some of the cases which we came across from Moneylife Foundation Insurance Helpline or emails received from Moneylife readers. Avoid the pitfalls which no financial planner or insurance advisor will tell you about. Nor can these be known from studying the mediclaim policy document. Mediclaim is not a simple product. It’s not a product you can purchase and forget about. It is a product which will keep you on your toes. Unfortunately, insurance fraud is a reality and insurers’ steps to counter it may adversely impact an innocent policyholder. 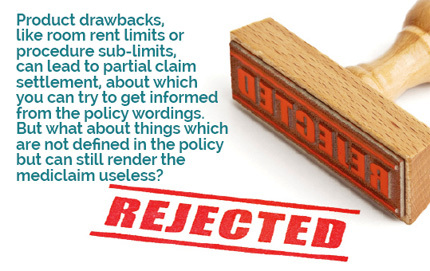 Read on to avoid blunders that can lead to rejection of claim or, even worse, make your mediclaim policy worthless. There are no easy solutions for some cases and even your best efforts for a fair claim can be met with unfair rejection by insurers. 1. What is your hospitalisation really for? If a patient with a fever is asked to get hospitalised for monitoring and diagnostic tests, the insured should be aware that the claim may be denied. Only if a procedure is required to be done, or there is acute infection which justifies hospitalisation for more than 24 hours, mediclaim will cover it—as long as there is a prescribed line of treatment. If it is not so, you need to figure out if your hospitalisation will really be covered or not. The recently launched Apollo Munich Dengue Care is an innovative product covering hospitalisation and outpatient treatment of dengue for consultations, diagnostic tests, pharmacy, etc. Your regular mediclaim should also cover hospitalisation for dengue, if there is need for such a treatment. Outpatient dengue care will not be covered under regular mediclaim, unless you are buying an expensive mediclaim product that covers OPD. Insurance contracts have a clause about the appointment of an investigator to examine the case. Here is an email response from New India Assurance (NIA) TPA to one insured (quoted verbatim): “Dear sir: please refer the policy clause no 5.4 as per that we can appoint an investigator to examine the case. The non co-operative by the insured will result into the Rejection of claim so you may please co-operate to investigate.” This is the text of NIA Mediclaim 2007 clause 5.4: “PHYSICAL EXAMINATION: Any Medical Practitioner authorised by the TPA/Company shall be allowed to examine the Insured Person in case of any alleged Illness/Injury requiring Hospitalization. Non-co-operation by the Insured Person will result into rejection of his/her claim.” But it does not specify whether the investigator can visit home, apart from nursing home or hospital to check the policyholder, meet the doctor, look at the reports, etc. If the insured has given an intimation of hospitalisation, then the investigator should visit the nursing home or hospital instead of waiting for the insured to return home. Why do investigators show up at the residence of the insured? Moreover, is there no reasonable time within which the investigator needs to complete the task assigned? One insured, who was hospitalised due to stomach ailment, had submitted all the claim documents and kept checking the website of TTK Healthcare Services (TPA) of New India Assurance to know the status of the claim. After a few days, the claim status showed settlement of Rs15,897 out of claim of Rs17,797. The insured was expecting the settlement amount to be paid, but instead received communication about the investigator wanting to examine the case. The TPA doctor wanted to visit the insured nearly three months after the hospitalisation to investigate. The insured refused due to the enormous delay and wanted nothing less than the claim settlement shown on the TPA’s website. The claim payment was done without investigation. Here is the grouse of the insured’s husband: “Is it a crime or sin if one does not remember correctly name of the doctor or hospital or for that matter even the precise date on which one was operated? If my wife’s replies were not absolutely on the dot, does it mean that this is a bogus claim? Have a human approach to things. She was in a tremendous pain when admitted; she was operated and discharged on day two.” If the case is genuine, the insured will have to fight on. Moneylife has always pointed out the need for accuracy of the dates on the hospitalisation records. Family members should also be aware of the dates when a pre-existing disease (PED) was found. If the doctor writes a wrong date or changes the diagnosis, it can lead to rejection, especially if it is a PED, or when there is a waiting period for specific ailments. Can there be excesses by the investigator also? What is the fine line between investigation to ensure there is no fraud and investigation to find a reason to deny a claim? You and your family need to understand that if the investigator is able to unearth something that can lead to claims rejection, then his value is going to increase for the insurer. Allow him to visit you at home with an appointment, if there is any justification for investigating at home. At the hospital, you can let him visit the patient only if the doctor allows, based on the patient’s condition. Be extremely careful about making complete disclosures when buying a policy. Insurance companies look out for even the slightest discrepancy as an opportunity to deny claims. Here is a case of an insured whose claim was rejected by Star Health. “My husband informed M/s UAE Exchange & Financial Services Ltd, Belgaum, agents of Star Health about heart ailment since 1996. He was asked to undergo pre-underwriting medical examination by empanelled medical doctor. The heart ailment was revealed to the doctor who conducted the medical examination as is evident from the noting in his report. The medical examination report also confirms ‘TMT STRONGLY POSITIVE FOR INDUCIBLE ISCHEMIA’. “When the first policy was issued, NIL was mentioned in PED column. This matter was brought to the notice of the agent. We were assured that necessary rectification will be effected. When the second policy was issued, mention was made against my husband’s name only (NIL-P/181200/02/2011/001960). Unable to figure out, it was again brought to the agent’s notice, who repeatedly assured that note has been made about the medical condition and no claim shall be entertained until 48 months of continuous coverage have elapsed since inception of the first policy with the company. The same noting continued in subsequent policies. The case shows both the apathy of the agent who fooled the customer about PED declaration and also the customer’s lack of understanding. It also casts a shadow on the insurer who did the medical tests which had revealed the medical condition. It is, indeed, baffling that PED is not specified in the policy when medical tests clearly show it. The lesson is: You will have to help yourself and ensure your proposal has all the declarations and these also appear in the policy document. If not, make a written complaint to the insurer or even cancel the policy as it is worthless without proper PED declarations. You need to keep a copy of the proposal received by the insurer and not just the copy of what you submitted. It may be difficult for you to fathom, but there are devious agents who tear off your PED declarations and substitute it with blank PED declaration so that the insurer will not reject the proposal. After all, the agent gets commission only if the insurer underwrites the proposal. If there is a serious ailment, the insurer is likely to reject the proposal. Our Insurance Helpline received a case from parents of a 19-year-old insured who was operated for a torn anterior cruciate ligament resulting from a fall on the college staircase. The insurer, Religare, had many queries about the case which were answered, but more questions followed. The parents of the insured wrote: “Religare has dragged an authentic and straightforward claim for nearly three months since the surgery. That’s not all. Religare is also hinting at litigation against the patient for which I’m ready to battle to get the ultimate justice.” When asked about help from the broker, the response was that “Medimanage is helping me out with my claim by escalating this to their senior management.” But the fact that Moneylife’s helpline was approached clearly indicates that the broker’s help was not yielding results. From Religare’s investigation, it was clear that it suspected that the injury was a pre-existing condition. 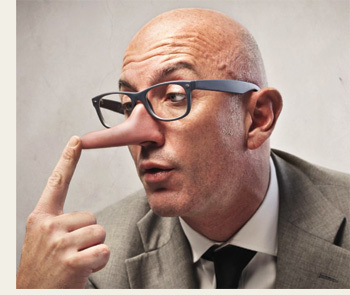 If surgery can be delayed by a few months, a fraudster will go out and buy an insurance policy and then go in for the surgery showing that the injury was recent. As the policyholder was only 19 years old, the suspicion was stronger, since people that young rarely take insurance. Moreover, the parents were not covered; only the 19-year-old son was. Our helpline advised the parents that they would have to request the surgeon to provide all the required details, namely, whether the injury was recent or old; what exactly the issue was; and the solution (medical terminology). They would have to submit the MRI report, orthopaedic report, operation theatre notes, hospital’s final bill with admission and discharge dates, payment receipt of final bill and so on. We informed the parents that even after submission of all these documents, if the insurer still rejects the claim, we would look at the case again. Luckily, Religare paid the claim. The insured had to get a written letter from the surgeon to prove that the surgery was not for any PED; the injury was due to a recent fall. Sometimes, the insured is held guilty until he proves his innocence. Depending on your profile, type of procedures done and other circumstances, you will have to be ready to prove that your claim is genuine. It is always better to purchase a mediclaim policy when you are young and healthy. It reduces any suspicion about the policy having been purchased after the onset of an illness. Unfortunately, most people go for mediclaim on turning 45, or are not in the best shape.Moneylife has seen cases of insurers refusing to underwrite consumers. If only the consumers had purchased the policy when they were in good health, they would be in a better position. If you happen to purchase mediclaim just before the start of your illness, the insurer will scrutinise your claim with a fine toothcomb. When you buy a new policy, there is usually a cooling period of 90 days, within which only accident or emergency claims are entertained. This is to prevent any claims for an illness existing at the time of policy purchase. 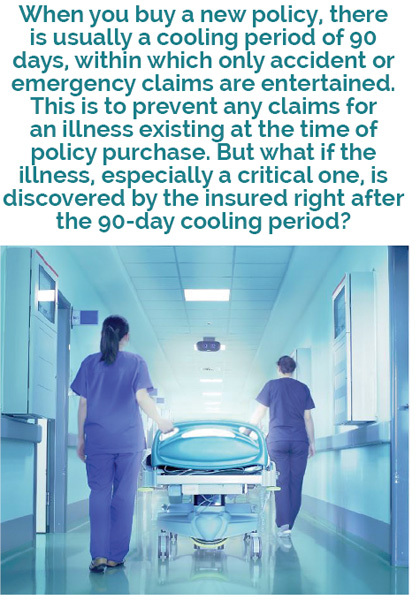 But what if the illness, especially a critical one, is discovered by the insured right after the 90-day cooling period? Will the insurer still suspect your motive? Is the cooling period really un-cool as claims just after the period gets over are still subject to suspicion? In April 2015, a Max Bupa policyholder filed a writ petition at the Delhi High Court against Insurance Regulatory and Development Authority of India (IRDAI), Max Bupa and Medanta Hospital. On 12 March 2014, the petitioner had purchased Max Bupa policy for himself and dependents. The family’s health was insured for sum insured of Rs30 lakh, and the petitioner’s personal health was insured for Rs20 lakh. On 14 June 2014, just after completion of the 90-day waiting period, the petitioner developed a cough and breathlessness. He was diagnosed with cancer on 10 July 2014. Max Bupa rejected cashless pre-authorisation request with the comments: “Cashless cannot be provided due to information about the chronicity of the illness and possibility of pre-existing conditions can be ruled out, hence the liability cannot be established at this juncture in view of the received document and need further verification, hence cashless is denied.” The petitioner had to bear the cost of eight chemotherapy treatments estimated to be in the range of Rs2 lakh-Rs2.5 lakh per cycle and spent Rs11 lakh from his own pocket for the treatment. The petition argues that the IRDAI did nothing more than assign a number to the petitioner’s complaint, and thereby failed to live up to its statutory duties. IRDAI concluded that denial of cashless facility by Max Bupa was justified on the ground that the petitioner’s medical condition needed further investigation, in order to rule out the possibility of the cancer being a pre-existing condition. Moneylife does not want to make any comment about the case, as it is sub judice. We wish the petitioner good luck in his fight with Max Bupa and IRDAI. According to Saikrishna and Associates, advocate for the petitioner, “Max Bupa has deposited about 75% of the claimed amount with the claimant, and are in process of verifying certain documents to release the remaining 15% of the claim. Further, Max Bupa has written to the petitioner that they are entitled to deduct 10% of the claim as a limit to the pre-hospitalisation and post-hospitalisation adjustments. The matter is listed next on 22 September 2015 before the Court. No counter affidavit/response has been served upon us either by IRDAI or by Max Bupa till date.” It is possible that Max Bupa had to make amends due to writ petition filed by the insured. But how many insured can afford to take the fight to such a level? Stents are small expandable tubes used to treat narrowed or weakened arteries in the body. In patients with coronary heart disease, caused by the build up of plaque, stents are used to open narrowed arteries and help reduce symptoms such as chest pain (angina) or to help treat a heart attack. Hospitals make huge profit margin on these items which they procure in bulk. They charge customers around Rs1.2 lakh to Rs1.5 lakh each for normal ones. The latest trend is imported absorbable stent, which cost Rs3.1 lakh each. Absorbable stents get absorbed in the body within two years, unlike regular stents which remain in the body forever. If two absorbable stents are used for angioplasty instead of regular stents, you can imagine how much the claim amount escalates. Should the insurer bear the cost of imported absorbable stent, especially if they are approved by Drug Controller General of India (DCGI) and have CE (quality) certification? It should certainly not be decided on a case-to-case basis. If the privilege is given to one, it should also be offered to the remaining too. Moreover, it should not be limited to group mediclaim customers just to retain business while the retail customers get short-changed. If a high-cost absorbable stent is given blanket approval by insurer for usage, the premium of policies can also rise. The insurer has to make the money somewhere if the claims’ costs have undergone steep escalation. Are the insurers confused about how to handle absorbable stent? In 2013, an insured covered by group mediclaim from Bharti AXA underwent angioplasty and applied for cashless facility. The total bill amount was Rs7.74 lakh (two absorbable stents were put during angioplasty). Bharti AXA did not pay Rs2.5 lakh stating that the stents did not have approval from the appropriate authority. After the insured took up the issue with the insurer, he was offered an additional Rs50,000. Not satisfied, the insured, with help of the hospital doctors and the stent-providers, collected the relevant documents showing the approvals for importing and usage of the stents in India. All hell broke loose. Bharti AXA dramatically changed their stand and started saying that they are rejecting the claim under the clause ‘Reasonable & Customary’. They offered to settle the claim by giving an additional Rs1 lakh. The insured procured internal email communications between Bharti AXA personnel. In the email trail, the employees were found discussing among themselves on which ground they can deny full payment. Finally, Bharti AXA rejected the full payment on the basis of one email of United India Insurance Company for a similar case. The insured says that it is clear that there is no appropriate clause to reject the claim. The issue is not just Bharti AXA for absorbable stents as there are other insurers who act similarly. It highlights the attitude of the insurers about covering new products which happen to be expensive. 6. Is Bone Marrow Transplant Really Covered? Here was a difference of view between the insurer and the insured on what constitutes bone marrow transplant and whether it can be considered different from stem cell transplant. Moneylife advised the reader to get the above-mentioned letter from the doctor to detail the procedure; this was done. It would help during the fight with the insurer at the level of insurance ombudsman. Stem cell surgery is excluded; but bone marrow transplantation is covered by Future Generali, ICICI Lombard and Star Health. But, they gave no feedback on this specific case. A policyholder may be confused about whether the policy covers bone marrow transplant or whether it will be termed stem cell transplant to reject the claim. Insurers are not saints and neither are the insured. Genuine cases are rejected due to a few fraudulent cases. 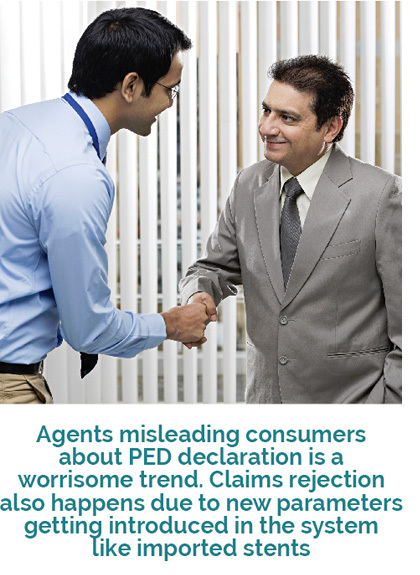 Agents misleading consumers about PED declaration is a worrisome trend. Claims rejection also happens due to new parameters getting introduced in the system like imported stents. The insurer may not have written rules for all the conditions, but the business works on the payment of reasonable and customary charges. The insured cannot expect the insurer to pay for everything under the sun, especially if the expenditure is unreasonably high. After all, the insurance business is about collecting premium for many and paying claims to a few. There are differences in opinion about the procedures like stem cell transplant and bone marrow transplant. There are questions if non-allopathic doctors of TPAs are qualified enough to make decisions on certain claims. Do the investigator doctors out there have a mandate to pick holes to deny claims? Handling of mediclaim policy is not an easy job as the product itself is complicated and the dynamic and stressful situations you and your family encounter at the hospital can make or break the claim. We hope these cases help you to remain vigilant. Indeed thanks for providing necessary information. I really appreciate to u,all are such a good information.Thanks.